So, as promised I am going to post some of my creative work here. This particular piece was something I wrote last year for one of my creative writing classes. We were given the broad topic of a story between two siblings that had not seen each other for a long time, but we could not say blatantly why but imply the reasons (similar to the way Ernest Hemingway implies the main problem in "Hills Like White Elephants"). Charlie stared across the park, letting the piece of white chalk roll between his hands. He glanced down at his watch. Half past three. He should be here by now, Charlie thought. Slouching down on the bench, he placed the chalk in the pocket of his worn jacket and rubbed his hands on his jeans. Near the twisted oak tree, a small boy with blonde hair was playing with his toy aeroplane. It swooped up in the air as the boy added sounds of zoom! and swoosh! It was funny; it didn’t seem so long ago that he and his brother had been playing in the street with toy planes and cars, or drawing pictures in colourful chalk. Charlie was eighteen now, graduating high school in two weeks. He wished his brother could make it. “Hey.” Charlie twisted his head around so fast that his neck seized up with sharp stabbing. Massaging the muscle, he winced a smile to the gangly teen sitting next to him. Dennis had always liked to sneak up behind him ever since they were young. “You’re late,” Charlie said to his brother. “Don’t know why I expected anything different.” A woman got out of her silver sedan parked on the far side of the street, carrying a brown bag of groceries. A large delivery truck drove by and Charlie blinked. The car had been silver, right? Now it was a navy blue minivan, the kind his mother had driven when he was young. “I was gonna ask you the same thing.” Dennis’ voice was squeaky, a bit too high pitched for a boy of sixteen. Then again, he had always seemed too young for his age, at least to Charlie. Dennis looked away from him, towards the park. Charlie followed his gaze and saw the little boy again. Six years old with blonde hair and a large smile. His toy plane was nowhere to be seen, instead he carried a bucket of coloured chalk. Blue, purple, orange. He skipped out from under the trees, kneeling down on the side walk. A bike rider came whizzing down towards him, veering away just in time. The boy took no notice. Charlie heard his brother speak softly next to him. “You know exactly what I’m talking about. It’s the same thing that kept me from entering high school, even middle school. The same thing that kept me from you, Mum, and Dad. Made it so that you were alone and blamed yourself.” His voice was higher now, childish. Goosebumps arose on Charlie’s arms and he knew he had to face Dennis, even though he didn’t want to. But he had to. Slowly, his neck turned his head towards his brother. The little six-year-old boy with blonde hair, swinging his legs off the edge of the bench. “It wasn’t your fault, you know,” Dennis said. Charlie hardly heard the words, shocked so much by this unreal vision. But then again, how could he not have guessed? It was so simple, so obvious. Ten years. How could he have forgotten? Something rushed past him, catching his eye. He whipped his head around, his neck screaming again in pain. But he didn’t care. It was the boy, the little boy carrying the chalk. He was running towards the street, busy with traffic. The woman he had seen carrying the groceries ran to the boy, throwing an arm around him, stopping him. She knelt down and scolded him. The boy nodded reluctantly, then gave his mother a hug. They disappeared inside the silver sedan. “There was nothing you could do, then or now.” Charlie didn’t turn to look at his brother and wished he could tune out his voice. It was too painful. 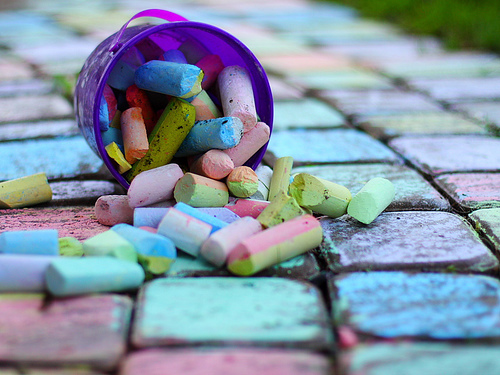 The chalk pictures in the street. Blue, purple, orange. And red, bright red. “I’m sor—“ Charlie turned. The bench was empty. He stood there, staring at it for a few minutes, then placed a shaky hand on the wood. The spot was warm. No, it’s cold. Dead cold. Putting his hand back in his jacket pocket, Charlie turned to leave. Then he paused. He pulled out the piece of white chalk he had been fiddling with all day. One piece. He had had it forever, it seemed. For many years now. He placed the chalk gently on the bench. After tens years, it was finally time to let go and move on.